NVMe Over Fabric (NVMe-Of) is a protocol which is defacto becoming high-speed standard to take advantage of huge IOPS provided by new NVMe devices hitting the market. NVMe-OF Target designed by StarWind is one of the latest and hot storage technologies overtaking old iSCSI. First of all, before we go further, let's recap what is NVMe Over Fabric (Of) Target and then give you some further details about the configuration. NVMe-OF can be connected on the host on demand and provide really fast NVMe storage. NVMe-over-Fabric is a newer standard that maps NVMe to RDMA in order to allow remote access to storage devices over an RDMA fabric using the same NVMe language. 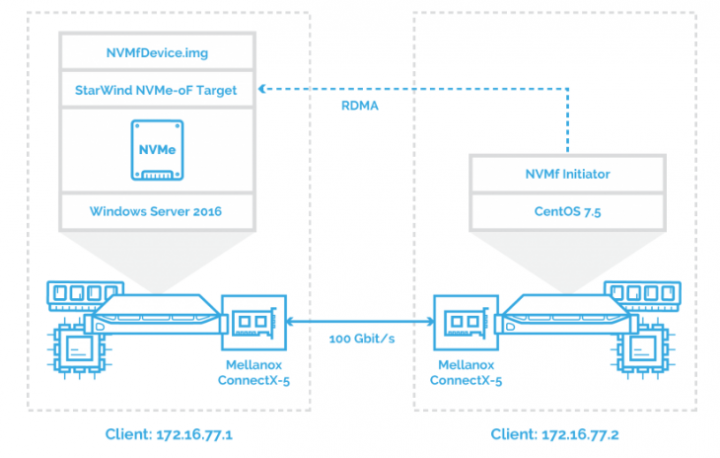 StarWind support for NVMe over Fabrics (NVMe-oF) – the protocol tailored to squeeze maximum NVMe performance at minimum latency and CPU utilization. NVMe has larger queue depth than SCSI (64000 over 254 for SAS, or 31 for SATA). StarWind NVM-oF Target delivers your applications the maximum IOPS that high-performing NVMe storage could ever provide. This protocol has been purpose-designed for fast communication with the NVMe storage over high-speed networks with a reasonable portion of server CPU power involved. So, both NVMe devices and CPUs are utilized efficiently bringing you high ROI. Latency-dependent applications get a consistent microsecond-scale latency with StarWind NVMe-oF Target. The protocol features multiple parallel command queues, 64 thousand commands each. Moreover, once combined with high-speed RDMA, NVMe-oF Target enables your applications to achieve almost the instant request response. Speaking of numbers, this protocol enables to build almost 8 times more efficient NVMe storage than if you use any SCSI-derived protocol. As you can see, NVMe-OF has lower latency than iSCSI and it's faster and more efficient. Here is an architectural overview. 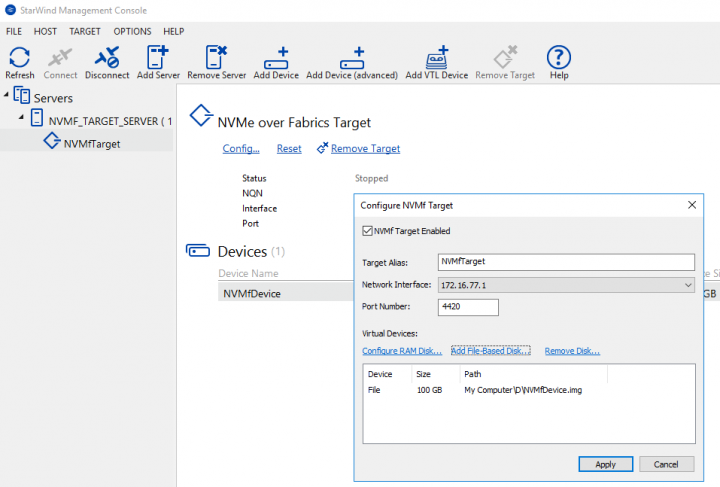 The NVMe-oF Target is created on Windows Server 2016 using StarWind NVMe over Fabrics Target service and discovered and connected on CentOS 7.5 via 172.16.77.x subnet. Basically, at one end you have Windows server where you install StarWind VSAN. After, you'll make sure to install the latest Mellanox drivers (provided via StarWind's post). On the other side, you'll have Cent OS with kernel version higher than 4.9, with some additional packages. 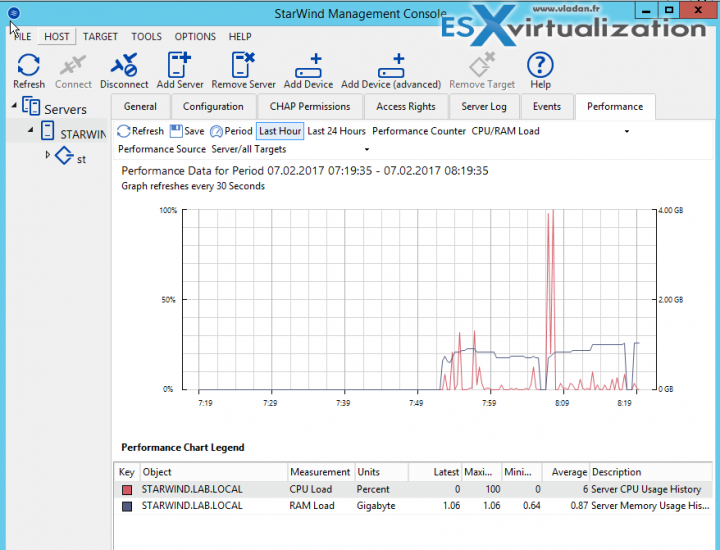 You can find the detailed blog post about the whole configuration here – StarWind Virtual SAN Creating NVMe-oF Target. From the same page, you can also download a PDF version of the configuration steps. StarWind is very flexible when it comes to installation and configuration. It can adapt to different scenarios and fill in different architectural choices. By providing the latest storage technologies, such as NVMe-Of target, it's clear that innovation never stops. StarWind Virtual SAN for Hyper-V – is a Software-Defined-Storage stack designed specifically for implementation on the Microsoft’s virtualization platform. VSAN installs as a bare metal Windows application directly on the Hyper-V cluster nodes intended for the virtualization. Once installed, it creates a highly available storage pool for the entire cluster. StarWind VSAN for Hyper-V smoothly integrates with Windows Server management and security tools to provide administrators with a centralized user-friendly StarWind Management Console. StarWind Virtual SAN for vSphere -is a VMware-only Software-Defined-Storage stack. A ready-to-go Linux VM installs on the cluster nodes to share their storage resources.